The laws protecting the brewing of kolsch are as strict as the German Purity Law of 1516. Kolsch beer can only be brewed within the city of Cologne. 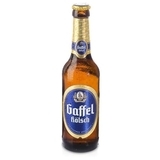 As the best-known kolsch brewery, Gaffel’s flavor is derived from an ale yeast that is “lagered” (or aged) in cold cellars. Gaffel is pale, faintly fruity with a crisp, hop finish.